When there is an opportunity to bake an entire meal on a single sheet, we are going to take it – we believe you should embrace the non-challenge too! In a world of fast, convenience foods, it takes a bit of a workout to get beyond the ease of pre-prepared options. Sure, canned fish is still better for you than the slice of pizza that everyone else seems to be eating, but if what you are after is true, life and happiness supporting health, then you are going to have to go out and find those quality ingredients that make you feel great. It’s not always easy, and sometimes it even feels like takes a lot of time to eat “better”, yet at the end of a nourishing meal, you’ll find that the extra effort was worth it. 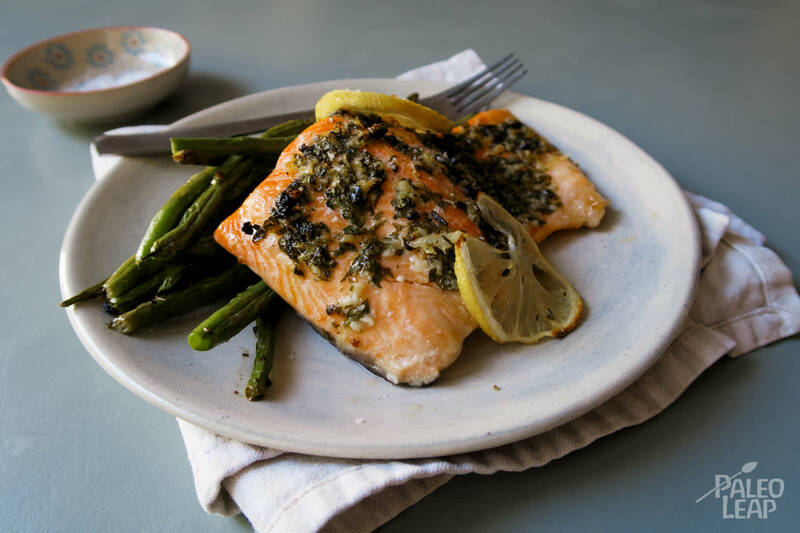 Take this baked salmon with green beans for instance – and yes, it is okay to consume green beans on occasion. Let’s focus on the salmon, where the bulk of the protein, Omega-3 fatty acids, potassium, selenium and B vitamins are. In general, fish, along with shellfish, are extremely nutrient dense, meaning that they pack a good vitamin and mineral punch in exchange for the calories that they lack. And while calories are not much of a concern, vitamins (from food) are certainly important in a healthy diet. Wash it down with a thyme lemonade and all will be right with your day. Combine the garlic, lemon juice and zest, parsley, cooking fat, salt and pepper in a bowl, mix well. Place the salmon on a baking tray and pour over the marinade. Add the green beans to the pan and drizzle with a little cooking fat and season to taste. Add the lemon slices on top of the vegetables and salmon. Place in the oven and allow to cook for 10-12 minutes until the salmon is cooked through.